Revenue from online sales increased by 27% to €3.2 billion, accounting for 14% of sales in markets with stores and onlineNet profit rose 2% to €3.44 billion, or 12% in local currencies, while EBITDA and EBIT reached all-time highs, supported by strong margins. Net profit rose 2% to €3.44 billion, or 12% in local currencies, while EBITDA and EBIT reached all-time highs, supported by strong margins. The Board of Directors will propose a new dividend policy at the next AGM, to be held in July. The ordinary dividend will increase to represent a payout ratio of 60% – up from 50% at present – and Inditex will also distribute a bonus dividend totalling €1 per share, split across 2019, 2020 and 2021. The change in policy translates to a 17% increase in the dividend for the year to €0.88 per share; €0.66 as an ordinary dividend and €0.22 as a bonus dividend. The Extraordinary Profit-Sharing Plan reaches a combined €32 million this year. €7 million of this will be due to their contribution to reported earnings growth while there will also be a €25 million top-up from the company. In total, Inditex will pay its employees €619 million of variable compensation. The Group’s store space increased by 5%, with openings in 56 markets, as it continued to update its store network with a focus on prime locations and the latest technology to provide an integrated store and online fashion platform to customers. Zara increased its presence to 202 markets, while Massimo Dutti and Uterqüe have just expended their online platforms to 106 new markets, boosting their reach to 184 and 148 markets, respectively. In FY18, Inditex’s capital expenditure amounted to over €1.6 billionto complete the rollout of RFID technology across all brands and expand the integrated stock management system, among others. This system is central to providing customers with the best shopping experience. The Group’s overall worldwide tax contribution amounted to €6.16 billion in FY18, of which €1.7 billion was in Spain. Inditex Group’s net sales rose by 3% in FY18 (1 February 2018 – 31 January 2019) to an all-time high of €26.14 billion, underpinned by growth in all of the Group’s geographic regions. Sales in local currencies grew 7%. Like-for-like sales growth remains robust, up 4% in FY18, and positive across all regions and brands, as well as in both the online and store platforms. Revenue from online sales continued to rise, up 27% year-on-year to €3.2 billion. Thanks to this momentum in the integrated store and online platform, revenue from online sales accounted for 14% of sales in markets with both a store and online presence. The Group’s margins also remained strong supported by the strategic investments in store and online integration, a continued focus on prime locations and the Group’s brands strengths. Gross profit increased by 4% to €14.8 billion supporting a 39 basis point increase in gross margin to 56.7%. The Group continued its policy of refraining from promotional activity during a period characterised by a strong negative currency impact due to a strong euro. EBITDA also registered considerable expansion to €5.46 billion, growth of 11% in local currencies. As a result, net profit increased by 2% in FY18 to €3.44 billion (12% growth in local currencies), reaching a new record in the Group’s history. 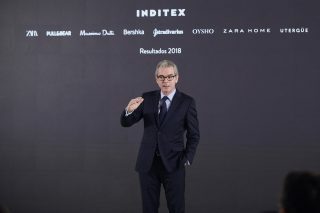 The chairman and CEO of Inditex, Pablo Isla, noted “our investments in both logistics and stores in order to leverage the integrated platform, as well as our continued focus on prime locations, has enabled Inditex to offer customers a consistent and appealing proposition globally, across all our brands and channels”. Store sales in local currencies increased by 7% from 1 February to 9 March 2019. Management estimates likefor-like sales growth of 4% – 6% in FY19. Underpinned by today’s results, Pablo Isla advanced that the Board of Directors will propose a new dividend policy at the Annual General Meeting to be held in July. The proposal consists of increasing the payout ratio to 60%, up from 50% currently. The new policy also proposes a further bonus dividend totalling €1 per share, split between 2019, 2020 and 2021. This motion will translate into a 17% growth in the dividend, equivalent to €0.88 per share over 2019 whereby €0.66 corresponds to the ordinary dividend and €0.22 to the bonus dividend. Inditex will pay €0.44 per share on 2 May and the other €0.44 on 4 November 2019. At the same time, around 92,000 employees with at least two-years of service will share in €32m of earnings growth under the second phase of the Group’s 2017-2018. Extraordinary Profit-Sharing Plan – whereby employees share in 10% of the incremental growth in profit. €7 million will be payable under this plan as a result of the earnings growth reported in FY18 and €25 million as an additional discretionary top up from the company, which is up from the €21 million top up contributed by the company the year before. In total, Inditex has distributed €153 million to its employees since it introduced this profit-sharing scheme. The Group intends to introduce a new plan in 2019 framed by specific targets, which in the case of store staff will be tied to sales growth. The Profit-Sharing Plan constitutes an incentive that complements the preexisting variable compensation arrangements which total €619 million paid by the company to the employees. In total, the company paid out €4.13 billion in employee compensation over the year. The Group’s strategy is to have developed a fully integrated, fully digital and fully sustainable store and online model equipped with the latest technology by 2020. In fiscal 2018 it maintained capital expenditure at €1.62bn to support this strategy. The capital expenditure went towards technology upgrades in stores and logistics platforms and to upgrading sales space in line with the strategy of fully integrating stores and online by focusing on larger stores in premium locations. As a result, the Group’s sales space increased by a net 5%, driven by new stores, extensive store expansions and refurbishments, improving the overall quality of the store network. The Group ended the year with 7,490 stores in 96 markets. The Group opened new stores in 56 different markets in 2018. New stores are now larger and offer more customer services. The average size of new stores opened in 2018 are 39% larger than the 2012 openings. In the case of Zara, new stores are on average 50% larger than they were seven years ago (2,184m2 in 2018 versus 1,452 m2 in 2012). All Inditex stores will be eco-efficient in 2020; by year-end 2018, 86% of its stores already featured the efficiency measures which translate into water savings of 40% and energy savings of 20% compared with a conventional store. In China, all of the Group’s stores are already eco-efficient. In addition, 38 of the Group’s stores boast the highest environmental rating, having obtained eight new such ratings in 2018. The initiatives carried out under the circular economy programme continue to develop. The Group has already introduced its Closing the Loop used-clothing collection scheme in 1,382 stores in 24 markets. Since the start of the programme in 2016, Inditex has collected 34,158 tonnes of clothing, footwear and accessories donated by customers for 12 organisations that will give them a new use or recycle them, including Caritas, the Red Cross, the Salvation Army and Oxfam, among others. In 2019, Zara announced plans to introduce 100% recycled, reusable and recyclable paper bags, in line with its environmental commitment. Last year, the Group’s websites registered 2.94 billion visits, reflecting growth of 500 million year-on-year, while orders fulfilled per minute reached a peak of 9,500. The social media profiles of the Group’s eight brands added 22 million followers in the last year alone, reaching a total of 143 million followers. The evolution of the integrated store and online model is prompting the expansion of the Group’s online presence: Pablo Isla has announced that all of the group’s brands will be available online worldwide in 2020. As part of that strategy, in November, Zara launched its global online store (Zara.com/ww) in 106 markets in which it does not have stores, as well as rolling out its online platform in Australia and New Zealand, where it does have a physical presence. On 20 March, Zara is scheduled to launch online sales in Brazil, where it has 57 stores which will be fully integrated after the launch. The brand also plans to launch its integrated platform with the initiation of online sales from the spring season in the United Arab Emirates, Dubai, Saudi Arabia, Egypt, Indonesia, Israel, Lebanon, Morocco and Serbia. In 2018, Zara updated its website image and mobile app, adding features that facilitate browsing and zooming in on specific trends in its ‘corner shop’ section. Pull&Bear’s online store made its début in the US, and Uterqüe’s online platform went live in Mexico, one of the brand’s most important markets. Before that, Uterqüe entered the Chinese market in August, adding its online store to Tmall and opening a flagship store on West Nanjing Road in Shanghai, one of the world’s most attractive shopping districts. In 2019, Massimo Dutti and Uterqüe followed suit, launching their global online stores, to extend their respective reach to 106 new markets. In addition, the Company plans to progressively incorporate Zara Home products onto the Zara website from next Autumn/Winter across a number of markets. Essential to the development of the integrated model is to provide the best customer experience which has seen the expansion of the same-day delivery service across all of the Group’s brands. This service is already available in large cities such as Madrid, London, Paris, Istanbul, Shanghai and Taipei, and in 2018 the cities of Sydney, Warsaw, Toronto, Moscow, Mexico City and New York were added. Meanwhile the next-day delivery service was introduced in Australia and Canada, adding to the existing service in Spain, France, the UK, China, Poland and South Korea. The plan is to gradually roll this service out across all of the Group’s remaining markets. The company is working towards having same-day delivery available in all of the major cities around the world and next day delivery in the other regions in which the company has rolled out its integrated platform. All of the Group’s brands continued to expand the click&-collect service whereby customers can place an order online and pick it up in-store at their convenience. Zara keeps introducing automated online order pick-up points in stores across markets, including flagship stores such as the Zara Stratford in London, Zara Vittorio Emanuele in Milan, Zara Haussmann in Paris and Zara Bilbao. These technologically advanced pick-up facilities are capable of stocking several thousand orders. The significance of the store as a distribution channel for online orders is growing all the time thanks to the integrated stock management system. These and other pioneering integrated services due for launch this year are being enabled by the deployment of RFID technology across all of the Group’s brands; in turn, that system is now enabling the integrated management of online and offline stock. This unique RFID system has been fully implemented at Zara, Massimo Dutti, Pull&Bear and Uterqüe and is in the process of being rolled out in the remaining brands. Thanks to this technology, Zara is already managing its stock on an integrated basis in all 49 markets in which it has both a physical and online presence and this capability is translating into an enhanced shopping experience for customers. The Group continues to have a significant positive impact on the Spanish economy, through the presence of the company’s headquarters, the number of Spanish suppliers contributing to the growth of Inditex and the Group’s tax contribution to the Spanish state. Inditex completed the latest expansion of its headquarters in Arteixo, La Coruna, in 2018. This represented a 120 million euros investment, to incorporate new working areas and open natural spaces with indigenous plants requiring little water, together with open working areas and a gym and new canteen serving over 5,000 employees. Functionality and sustainability are the bedrocks of this facility, with efficiency measures that reduce energy consumption by 45% and water use by 30%. The facilities will qualify for LEED Gold certification. The expansion added 80,000 m2 to the existing 160,000 m2 headquarters. Together with the company’s 10 wholly-owned factories around the town, the central logistics platform and the new A Laracha centre, which is devoted to supplying the factories with fabric, Inditex Headquarters in Arteixo totals over 1,000,000 m2 dedicated to every textile activity reflecting the Inditex integrated model: fashion design and creativity; patternmaking, manufacturing, logistics, distribution and retailing. Subsequent to the year end, the company has started construction of new facilities devoted to the new Zara.com studios and working areas. Open and multifunctional spaces with the latest audio-visual technologies will give our online teams capability to create the best quality product pictures and videos. Our headquarters activity in Spain also has a positive impact on a large number of suppliers. In FY18, some 7,500 Spanish suppliers invoiced Inditex more than €5 billion. In the last five years, Spanish suppliers have invoiced Inditex more than €23 billion. Inditex’s overall tax contribution exceeded €6.17 billion worldwide in 2018. Of this total, €2.76 billion was the result of the direct activities of the Group companies around the world and over €3.4 million was different taxes paid as a result of the Group’s activities, such as personal income tax, property taxes and environmental taxes. In Spain, Inditex’s total tax contribution reached €1.7 billion in 2018, including direct and collected taxes. The effective tax rate paid by the Group companies in Spain was 22%. During the last five years, the company paid more than €2 billion in corporation tax in Spain, equivalent to over 2% of all corporation tax collected by the Spanish state. In 2018, Inditex’s eight retail brands (Zara, Massimo Dutti, Pull&Bear, Bershka, Stradivarius, Oysho, Zara Home and Uterqüe) continued to be very active in terms of both commercial initiatives and brand positioning and reinforcement. Zara continues to be named among the most prestigious brands in the world in influential rankings and studies, such as the Best Global Brands list compiled by Interbrand, in which it features as one of the top 25 brands in the world. Underpinned by its strategic commitment to creating quality fashion based on the latest trends, a seamless interface with customers and understanding of their shopping preferences, Zara continues to innovate with pioneering initiatives that combine creativity with digitalisation, all of which is communicated simultaneously from the best retail premises and digital assets (websites, apps and social networks) globally. Key innovations last year included the introduction of an augmented reality experience in over 130 stores around the world with its temporary ZaraAR initiative, the launch of a special collection called VIEW.S, the result of a collaboration between the brand and brilliant rising stars from the world of art and design, and engagement with the design school at Bunka Gakuen University (Japan) on a men’s collection. 2019 has started with the brand working with the Chelsea College of Arts (London) on a capsule collection for Zara Kids. Zara once again worked with renowned photographer Steven Meisel on the launch of its Autumn/Winter and Spring/Summer collections. It launched a new exclusive and limited-edition collection called ZARA SRPLS, a unique range that redefines the military aesthetic for contemporary lifestyles, aiming to provide a benchmark for how to combine different pieces for fresh, everyday looks. Finally, Zara launched a new lipstick collection inspired by the make-up needs that arose during the filming of the brand’s campaigns. The rest of the Group’s chains also presented their customers with inspiring and holistic initiatives, such as Massimo Dutti’s new fragrances, special editions and catwalk shows in Paris and Shanghai, which were broadcast live on social media whilst the products were available for purchase online. Uterqüe, meanwhile, also presented its newest fashions in catwalk format last autumn and celebrated its tenth anniversary with the publication of a commemorative Art Book. The world of sport, from motorcycle racing to surfing, was once again Pull&Bear’s choice for a host of initiatives. It also launched collections with global relevance, such as a line designed in collaboration with the singer Rosalía. Music is always a central theme for Pull&Bear and in March 2019 the brand launched a new collaboration with Barcelona’s Primavera Sound, one of the key Festivals for alternative music. Stradivarius also collaborated with influencers and renowned artists. It launched the STR Collection, showcasing the brand’s urban and casual side with a capsule collection based on the notion that ‘fashion must be lived’ and articulated around sporty and relaxed trends and organic, recycled and upcycled fabrics. The brand has also launched its new STR Essentials fragrances. Bershka launched two new collections together with Converse, one in collaboration with the artist Miley Cyrus who was photographed by the legendary Ellen Von Unwerth capturing the singer’s energetic, brave and inclusive nature. Towards the end of the year, Oysho inaugurated Oysho Sport, a new section where customers are able to locate all of the brand’s sports collections by discipline: boxing, tennis, water sports, fitness, yoga, trekking, skiing, running and new additions such as cross-fitness and cycling. The new website can be accessed via either one of two separate portals: Oysho or Oysho Sport. Lastly, in the second half of the year, Zara Home unveiled its latest store concept which makes it even easier and more intuitive to browse the brand’s collections. Throughout 2018, all the Group’s brands continued to expand the scope of their collections made and sold under the Join Life label which highlights those garments made using more sustainable materials or more environmentally-friendly manufacturing technologies. In FY18, the Company put 136 million Join Life items on sale, which was 85% more than in FY17. Inditex was named the most sustainable company in the retailing industry for the third year in a row by the Dow Jones Sustainability Index (DJSI). The Group joined the New Plastics Global Economy Commitment, championed by the Ellen MacArthur Foundation in collaboration with UN Environment, as well as the Fashion Industry Charter for Climate Action. In tandem, Inditex continued to promote diversity and equality in all its activities, signing up for the Embrace Difference campaign, the European Round Table of Industrialists and the ClosinGap initiative, focused on the gender gap in education in Spain. The company also continued its programme for hiring talent specifically selected from groups at risk of exclusion in 13 markets, including Korea and Turkey which were added to the initiative known as SALTA in 2018. Under this initiative, a total of 1,170 people have joined the company’s workforce. The opening of Uterqüe for&from in San Sebastián de los Reyes (Madrid) represented the 14th store of Inditex’s programme designed to create employment for people with disabilities. For&From already employs 166 people and reached net sales of €11 million in 2018. The proceeds of these stores go to the specialised charities that help manage them. Elsewhere, Inditex joined the global TENT Partnership for Refugees (www.tent.org), which works with the private sector to improve the living conditions of over 25 million people who have been forced to leave their home countries. Membership of this initiative, which supports refugees in 34 countries, stands at over 100 companies. Inditex also maintained and renewed its support for several charitable initiatives, working hand in hand with its core partners, including Caritas, the Red Cross, Médecins Sans Frontières and Water.org. During 2018 the company provided €46.2 million towards social investment projects, directly benefitting 2.4 million people.